The Arabic word jihad means literally "struggle" and Islamic scholars have long been divided on how it should be interpreted. For some it means the struggle to defend one's faith and ideals against harmful outside influences. For others it has come to represent the duty of Muslims to fight to rid the Islamic world of western influence in the form of corrupt and despotic leaders and occupying armies. This is a view that has come to be widely accepted among the more militant Muslim groups, although most would not agree with the methods adopted by Osama Bin Laden and the al-Qaeda movement. The origins of Bin Laden's concept of jihad can be traced back to two early 20th century figures, who started powerful Islamic revivalist movements in response to colonialism and its aftermath. Pakistan and Egypt - both Muslim countries with a strong intellectual tradition - produced the movements and ideology that would transform the concept of jihad in the modern world. In Egypt, Hassan al-Banna's Muslim Brotherhood and in Pakistan, Syed Abul Ala Maududi's Jamaat Islami sought to restore the Islamic ideal of the union of religion and state. They blamed the western idea of the separation of religion and politics for the decline of Muslim societies. This, they believed, could only be corrected through a return to Islam in its traditional form, in which society was governed by a strict code of Islamic law. Al-Banna and Maudoudi breathed new life into the concept of jihad as a holy war to end the foreign occupation of Muslim lands. In the 1950s Sayed Qutb, a prominent member of Egypt's Muslim Brotherhood, took the arguments of al-Banna and Maududi a stage further. For Qutb, all non-Muslims were infidels - even the so-called "people of the book", the Christians and Jews - and he predicted an eventual clash of civilisations between Islam and the west. Qutb was executed by Egyptian President Gamal Abdel Nasser in 1966. According to Dr Azzam Tamimi, director of the Institute of Islamic Political Thought in London, Qutb's writings in response to Nasser's persecution of the Muslim Brotherhood, "acquired wide acceptance throughout the Arab world, especially after his execution and more so following the defeat of the Arabs in the 1967 war with Israel". Qutb and Maududi inspired a whole generation of Islamists, including Ayatollah Khomeini, who developed a Persian version of their works in the 1970s. The works of al-Banna, Qutb and Maududi were also to become the main sources of reference for the Arabs who fought alongside the Afghan mujahideen in the 1980s. One of these was the Palestinian scholar, Abdullah Azzam, who had fought with the PLO in the 1970s but became disillusioned with the Palestinian leadership because of its secular outlook. Azzam studied Islamic law at Cairo's Al-Azhar, where he met the family of Sayed Qutb, and went on to teach at university in Saudi Arabia, where one of his students was Osama Bin Laden. In 1979, the battle to liberate Afghanistan from Soviet occupation gave Abdullah Azzam a golden opportunity to put his revolutionary Islamic ideals into practice. Dubbed the 'Emir of Jihad', he was one of the first Arabs to join the Afghan mujahedeen, along with Osama Bin Laden. Together they set up a base in Peshawar, where they recruited and housed Arabs who had come to join the "holy war". Azzam published books and magazines advocating the moral duty of every Muslim to undertake jihad and he travelled the world calling on Muslims to join the fight. Saudi Arabia, which follows the fundamentalist Wahhabi school of Islam, had become a natural haven for radical Islamist scholars, including the radical Egyptian Islamist Ayman al-Zawahri. The ruling family, which had been criticised for its pro-western stance, seized upon the Soviet invasion of Afghanistan as a cause which could rally Islamist support and deflect internal criticism. The kingdom now threw its political and financial weight behind the Afghan jihad, which was also backed by Pakistan and the United States. Pakistan found it useful to nurture its own jihad movements, which could be harnessed in its territorial dispute with India over Kashmir. The Saudi Islamist Saad al-Faqih says that the Islamic scholars in Saudi Arabia were careful at that time not to talk in terms of a jihad against anyone other than the Soviet occupiers of Afghanistan. 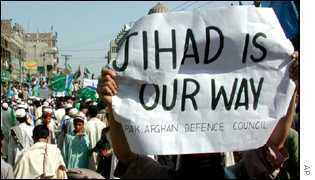 But he says that the war in Afghanistan created a longer-term "mentality of jihad" which some found hard to abandon. Once the Soviet forces had been expelled from Afghanistan, Azzam believed that the Arab fighters should return home and resume their former occupations, according to Dr Tamimi. But followers of the Egyptian Islamic Jihad movement, an extremist offshoot of the Muslim Brotherhood led by al-Zawahri, argued that "Afghanistan should be a platform for the liberation of the entire Muslim world". Dr Tamimi believes Azzam's assassination in a car bomb in Peshawar in 1989 helped Zawahri's more hardline view to prevail. Zawahri's cause was strengthened by the 1991 Gulf war, which brought US troops to Saudi Arabia. After devoting their lives to the liberation of Muslim territory from foreign occupation, it was a bitter blow for Bin Laden and his Arab mujahideen to see land they regarded as sacred occupied by "infidel" soldiers. Zawahri's growing influence over Osama Bin Laden and the al-Qaeda organisation paved the way for the notorious 1998 "declaration of war" against the United States and the spate of terrorist attacks on American targets that followed.